Kashi Vishwanath Temple is arguably the most famous of all Hindu temples and is dedicated to Lord Shiva. It is located in Varanasi, Uttar Pradesh, India, the holiest existing place of Hindus, where at least once in life a Hindu is expected to do pilgrimage, and if possible, also pour the remains of cremated ancestors into the River Ganges. The temple stands on the western bank of the holy river Ganges, and is one of the twelve Jyotirlingas, the holiest of Shiva temples. The main deity is known by the name Vishwanatha or Vishweshwara meaning Ruler of the universe. 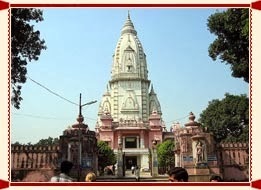 The temple town, which claims to be the oldest living city in the world, with 3500 years of documented history,is also called Kashi and hence the temple is popularly called Kashi Vishwanath Temple.The temple has been referred to in Hindu theology for a very long time and as a central part of worship in the Shaiva philosophy. The current structure was built by the Maratha monarch, Ahilya Bai Holkar of Indore in 1780. Since 1983, the temple has been managed by the government of Uttar Pradesh. During the religious occasion of Shivratri, Kashi Naresh (King of Kashi) is the chief officiating priest and no other person or priest is allowed to enter the sanctum sanctorum. It is only after he performs his religious functions that others are allowed to enter.